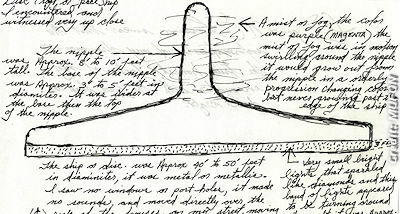 An Idaho witness at Meridian recalled a UFO event from 1977 when a disc-shaped craft hovered over a nearby home and moved towards him, according to testimony in Case 75381 from the Mutual UFO Network (MUFON) witness reporting database. The witness was driving home in his truck late at night on May 5, 1977, and noticed the UFO hovering just above a neighbor’s roof as he pulled into his driveway. The case was reported to MUFON on March 23, 2016, and is under investigation by Idaho STAR Team Investigator Charles Stansburge who provides the account details. The witness continued to watch the craft as it noiselessly and slowly approached where he was standing. At first the witness did not see any detail under the craft, but when it passed nearer to him he saw pulsating, colored lights in rectangular panels on the underside of the craft.